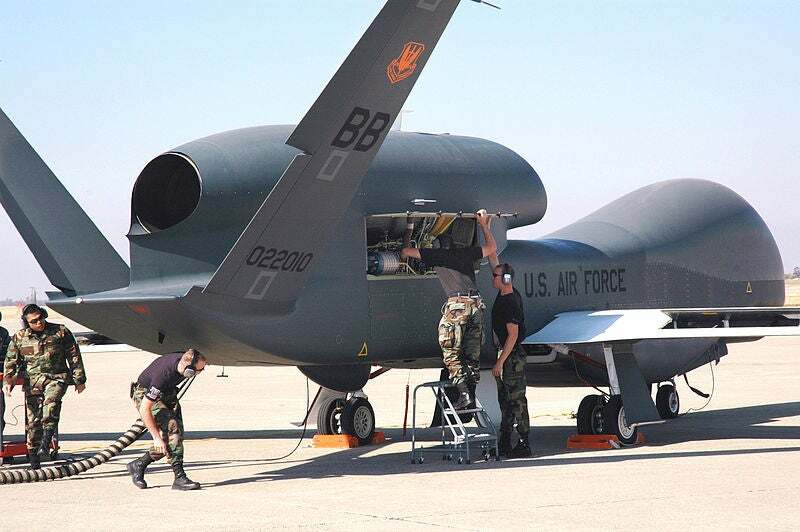 The US Air Force (USAF) has taken delivery of the second Battlefield Airborne Communications Node (BACN) equipped Block 20 Global Hawk unmanned aerial vehicle (UAV) from Northrop Grumman at Grand Forks Air Force Base in North Dakota, US. Achieved four months ahead of schedule, the delivery follows a $47m contract secured by the company in December 2011 for purchase and installation of two BACN payloads on two current Global Hawk aircraft to support the US Central Command (USCENTCOM) missions. Northrop Grumman Aerospace Systems Global Hawk unmanned air systems vice president George Guerra said the integration of BACN with Global Hawk will enable military commanders to offer the system’s critical capabilities during a single flight lasting more than 30 hours. "This is important when ground units operate in mountainous terrain where land-based communications systems don’t function as well," Guerra said. Northrop Grumman Information Systems network communications systems business vice president Claude Hashem said with delivery of another BACN-equipped aircraft, the company is continuing to deliver enhanced communications capabilities at improved operational availability rates to the USAF. "Our military counts on the enhanced combat effectiveness provided 24 hours a day, seven days a week by the BACN gateway capability,” Hashem said. The first BACN-equipped Global Hawk was delivered by the company to USAF in early June 2012. Equipped with an airborne executive processor (AEP), the high-altitude BACN is a forward-deployed network-centric enterprise information server designed to allow data sharing between different battlefield communications systems using a suite of computers and radio systems. The payload is already integrated in three E-11A Bombardier Global Express BD-700 aircraft and three EQ-4B Block 20 Global Hawk unmanned aerial vehicles (UAVs). BACN was first deployed by the USAF to Afghanistan in support of Operation Enduring Freedom (OEF) in 2008. Northrop serves as prime contractor for the air force’s Global Hawk programme and received the first BACN contract in 2005. Image: A USAF’s Global Hawk UAV being prepared for a runway taxi test at Beale Air Force Base in California, US. Photo: United States Air Force courtesy of Stacey Knott.